This article provides information on how to set up and create a call queue group on your AT&T Office@Hand account. Groups allow you to manage incoming calls so that they are catered by a designated group of employees with similar activities. Create a Call Queue group when you want a specific group of users (such as Sales, Support, or Billing) to share incoming calls. Call Queues are different from extensions. Call queues increase the efficiency of your company by directing the calls to the right employees. 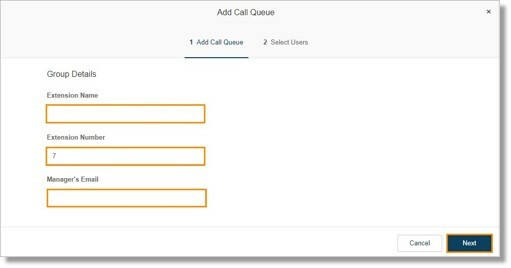 Call queues can support up to 25 calls waiting in a call queue. Note: You need to be an Account Administrator or the Call Queue group’s Manager to perform this action. Go to Phone System > Groups > Call Queues. Click the New Call Queue button. The next available Extension Number is automatically added to the Extension Number field. You can change it, and then enter the Extension Name, and the Manager Email. The manager email will receive the email notifications for the group that you are creating. Click Next. Select the Call Queue members from the list. Click the checkbox on the members you want to add then click Done. Note: The page will return to the Groups list, where you can see the Call Queue group that you created.